Posted February 20th, 2013 . Awesome! I’m really happy 🙂 he is really cute. I miss my little Cindy. Happy birthday! You look like my boy, Mose. Glad you beat the odds! What a sweetie…..Yay for you!!!! Keep on gettin’ shamed, that’s what makes life worth living!!! Love, Hadley, Guinness and Nala! 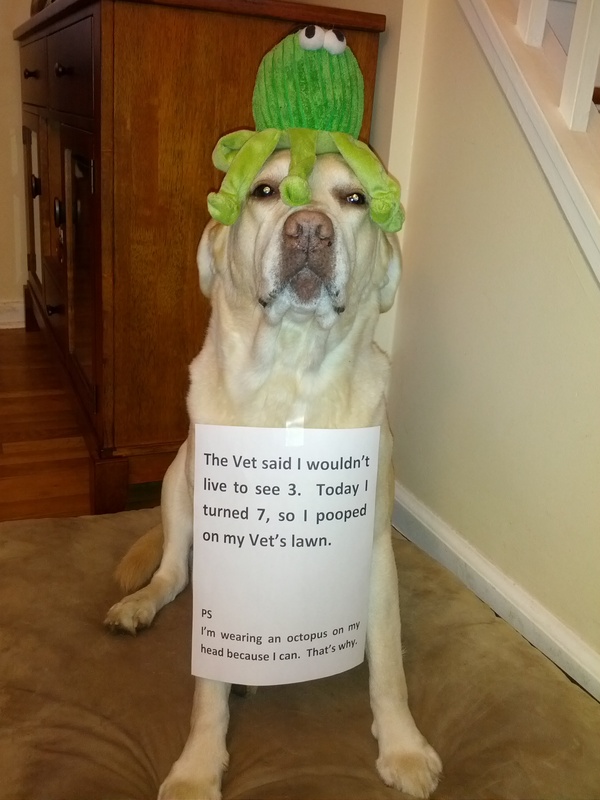 Congrats sweet pup… No shaming needed…ps, you look beautiful in octopus…. Love the octopus.. You rock! YAY! Happy Birthday! And you rock that octopus!! Happy birthday, sweet pup! You show that vet! Fantastic….I’m wishing you many more dog years! Happy Birthday – good dog! Happy Birthday…many more Octopi to come! Well, good for you! You’re a beautiful puppy! Wish you many more birthdays and octopi!! Way To Go!! Love the embellishment!! Silly vet, I’ll show you!!!! Poop on, dear doggy, poop on! I love your spirit. You give hope. An extra special Happy Birthday to you! Yay!!!! You rock!! So happy – and you look great! I’ll bet the vet is glad to be wrong in this case. Enjoy many birthdays! Happy birthday sweetie!!! You wear that octopus and make the vets yard all your own anytime!!! If it’s a repost, then thank you! I missed it and LOVE a happy (not-)ending! Are you a Lab or a Golden Retriever with a haircut? Happy Birthday Sweetheart! Seven years? No – Cento di questi giorni!!! 100 more!!! This is wonderful…Happy Birthday to a beautiful dog! And I love the octopus! I saw this a bit ago on Facebook (in fact my vet posted it!) and it brought happy tears to my eyes. My special girl Dora (the Hoarder) has hemangiosarcoma and was given 6 months to live 23 months ago (we’re planning something special for the 2 year mark!) I really am just so happy for you both. Exellent – you keep poopin’ puppy! What an awesome dog! Happy Birthday to you! I hope you live 7 more years and get to wear that octopus every year! You are adorable !!!! Happy birthday handsome! You have a fantastic sense of humor! LMAO!!! hahahahaha!!! !